I am currently visiting friends and family in England. While I am doing this I am getting to show these people the fairly large number of games and Apps I have made over the last 3 or 4 years. The problem is, all these people are on Facebook and see my timeline. Also they see the comments I make weekly about my developments, as well as simply knowing about what I am doing from word of mouth. So how come they don't appear to notice what I have been doing, or even know any of my published games. Whether they be on XBLIG or Phones or Tablets. If I cannot get the message out that I have created a new game and it costs a dollar etc to the.. Then how can I feel any sort of confidence that I have random people I don't know covered. The fact is I cannot. Instead I feel annoyed and let down that I have not gotten even my family to not only be aware of my games, but also to download them and try them out. I am really frustrated by this turn of events. I will now have to consider what I am going to do to tackle this problem in the future. Cos if I cannot get promotion and first buys from family and close friends.. I am probably doomed already. Yep, it happens time and time again. I think I have solved all the bugs in the game, but then I find a new one. Or more likely I find several more while testing the fixes to bugs I just.. well fixed. I subscribe and wholly believe that any program that goes out the door as complete, is also complete with several bugs. the only thing you can truly hope for is that none of the published bugs are really bad. such as halting game progression, or allowing exploits to render the game worthless. Oddly enough though...even as I believe that no game goes out without some bugs in it, I also try hard to eliminate all the bugs I can find. And only when I have an empty bug list do I feel good about the state of the game. Odd when I should be paranoid that there still lurks some nasty bug just waiting to come and play, and render my game useless or annoying or simply broken. As I happens I just finished off my little bug list. I was of course very happy. Then I decided to put the game onto my daughters Android phone. Good move to test a whole lotta stuff out. as it happens it turned up a nasty control bug because of the screen rescaling. A good find and an easy bug to fix. Still it is hard as an independent developer to really get a lot of good testing. It is pretty easy to get lots of sloppy testing. I hope to remedy this with the use of the amazing TestFlight and with that system allowing me to setup a bunch of testers more easily. I will then keep track of how good each tester is (how many bugs they find, and also rate each bug for finding difficulty etc). Then in the future I will have core group of testers to work with, along with the not so core group. It is possible for a tester to find only 1 bug of course, but if they are the only one to find it, then they have a real value. I know I have talked up the whole Texture Packer and sprite atlas thing. But I have to mention it at least once more. This time it is about the cannot fit feature that the editor employs. Here I was with a fairly full 2048x2048 texture, when all of a sudden I have a bunch of new graphics to add to the sprite atlas. The thing was that there was so much to add that I had too many pixels to fit into too small an image. Texture Packer showed me I was over by doing it's best fit and showing me a strip of the images that did not fit. This was great as I could see just how many pixels I needed to clean up to get the extra ones onto the sprite sheet. So I looked at my sprite sheet and started reducing the size of some of the images that were being shrunk when rendered in the game. This allowed to slowly but surely get more of the extra images to fit onto my sheet. I also noticed that a few images were not packing close enough together, and this led me to the discovery of some very alpha'd pixels at the edges of some animations. Needless to say I cleaned up those image borders and then all of my images fit into the sprite atlas. I really think without such a responsive and visual aid, my job fixing this up would have been so much harder. And now after you have read that, you know you want it don'tcha. Last night I was able to sit down and analyse my last screen resizing display bug. The one I had left was whenever a sprite rotated on the newly sized screen the origin would not be in its center, so making the sprite move around the screen while rotating, a stupid looking bug. Especially when my enemy craft have explosions going off all over them randomly, and those explosions are randomly rotated to give more visual appeal to the explosion animation. What is the Dynamic Screen Displaying? My game is designed to run in a fixed resolution (it is a 2d game after all). In this games case I am using the iPad resolution of 768x1024 (portrait mode). So all my graphics and relative sizes are laid out for this resolution. Which is a great thing if you are only going to be on this machine. As it happens I also want my game to work on other devices, and therefore other resolutions. So saying I want to use a 640x960 (iPhone 4) resolution, I make my game do scaling adjustments to fit this new size. I have an X Scale as well as a Y Scale and they are set by dividing the new resolution by the original one. So in the iPhone4 case the XScale=640/768=0.833f. Then I multiply all my rendering cords by these scales. I also have to scale the size of the image as well. What this means is only the rendering and a few other systems need to care about the resizing of the screen. The game underneath still works within the original coordinate system. So the players movement still goes from 0 to 768 across the screen. With this visual compensation the game is good, and then I simply have to fix any oddities. For example the cords that I get back from the touch, must also be rescaled back up to the original values. Hoopfighter has 28 levels in it. I have now laid out and tested all 28 levels. Phew... Some of them flowed out of me so easily, and some took a lot of persuasion. What I found was that when I an easy one, that another easy one would follow. When I was struggling with a level, I also struggled with the next one. This was a little annoying at times as I am sure you would expect. Although I didn't quite have the variety of enemy attacks I really wanted, I am very surprised just how many combinations I was able to place into a level and have them feel like fun. And more than that, have them feel different to each other, though some times in subtle ways. In the end I am rather pleased with the way the levels have turned out and I hope that players will enjoy figuring out how to get through them. This game is not a twitch reaction game though as I first thought to design it. Instead it is now more of a game where the player must learn the patterns, and then the best way to deal with them. Interestingly there are several ways to deal with each level and some are worth a lot more points than others. So this should be great for people after a higher score on a level than a friend. Next up is to fix the audio, or more correctly put... get some proper sound effects put into the game. Then I will do the music and I should be done. I have only just gotten back from Canada for a works trip that turned out to be a real trial (to get there), but was so worthwhile once we did. I got to work several cool guys from our employing company and we had a very successful week, as good as I could have hoped. If not for all the internet connectivity issues it would have been near perfect. Still I have just arrived back and yet am about to leave in a couple of days to go to England. This will be a vacation to remember I hope. My kids were both born in the USA, yet they feel so connected to England as both me and their mum is English, from a place in the midlands called Derby (pronounced Darby). so they get all these Englishisms and affectations. We don't get to go back to blighty anywhere near as often as we would like of course, it is a very expensive business (6K dollars just for the flight tickets alone!). So going is very important. Both me and the wife love our brothers,sisters, uncles, aunts, cousins and of course our parents. this time we are going to give our kids more of a visit than usual. Normally we get into London and then immediately drive up to Derby and that's about it. This time we are doing more touristy type stuff before we head there. This time we will have a few days in London and also head in an indirect route to Derby. This is all very exciting and I am quite giddy to be honest. I am also hoping that the rest and the inspiration the vacation will endow me with is going to help me along with al my extra curricular games programming. I tend to find anything inspirational. Though I have to say the inspiration to be more successful is never more manifest than when I visit family. Not because I want to show off or anything, but simply because if I was selling more games I would have more money, and more money would mean more visits to England, or maybe help my family come visit us in California. Everyone gets their inspiration in varying ways. I am hoping when I get back that I will be able to use that to my advantage, and finally get a game that is seen and played by hundreds of thousands of players. Till I get back, my Blog posts are going to be sporadic at best. I will be back properly in August. It is very frustrating when you go somewhere and in this day and age I cannot get a good internet connection. My hotel during my current stay in Moncton, Canada has issues. Using some company called iBahn to police their connectivity at the hotel. It is bad as I use like most people now the internet to connect with my family. also I use it for work and emails. What the heck am I supposed to do when I don't have connectivity. I have been busy trying to piggy back any networks I see around I can connect too. Geez, what a pain in the arse. Hopefully one day all these places will have their connectivity fixed and working properly and I won't feel so aggravated that I cannot Skype with my family. Just a complaint post, as what I am connected to at the moment is about to kick me off. GAH! When it comes time to setup the triggering of enemies on my levels, I tend to like to do it in an orderly manner. So mostly I start from level 1 and then move through levels 2, 3 and 4 etc. In both my current games I am working on Space Invaliens and Hoopfighter, I have done this. Yet I know some people start off o levels that may indeed be level 1 when they create it, only to find they have a much better level 1 they create later. Something that looks better for the game. This is also true of any level created, and the order it should go into the final game. I have been known to create levels early on and when I have created other levels I find those new ones fit much better for early round play. This is sort of true right now in Space Invaliens, as a couple of the Aliens (enemies) I have created for the player to battle are easier or harder than I expected. So I simply swapped which levels they first appear on. In tis game I can be really flexible because of it's design of introducing new enemis at a steady rate, and all of the enemies being unique anyway. 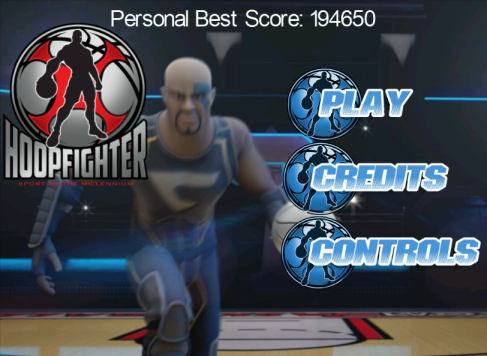 Now Hoopfighter is a bit different. I have so many training enemies created and several REAL enemies that look like rival players. So I have a full layout of the 28 levels in note form for when new enemies will appear. Which makes balancing the game per level a lot more important, as I have very little swap wiggle room. Both these methods are fun and rewarding. I love graphical consistency in my games. I am terrible at achieving that myself. Heck I am really terrible. I rely on my artists to make sure I am consistent. Today I have received a bunch of updated graphics for Hoopfighter and I have been busy getting them into the game. They look pretty good I think, and I love the fact my buttons now all look consistent. YAY! As you can see in the image above. I now have a nice consistent look to the input buttons. All the menus finally look this together as well, which makes me feel much better about the overall look of the product. I am very busy right now setting up the levels as I already have the video sequences all in. So far the App is 76MB in size. I also have the music sorted ready to go in, but not got to that yet. I am hoping to have 10 levels in before I do the music. Some times it doesn't matter how hard you try, ya have to cut stuff, otherwise all the rest of the hard work is wasted. I am in that mode at the moment and am having to cut one of the control options from the Hoopfighter game. It will probably make the game tighter, and also a lot easier to play (not bad things in and of themselves). Still removing something I have designed and even implemented a bunch of is a bit disheartening. On the bright side it is good that I realize that I cannot possibly get everything right first time out. Although the catalyst for this modification is not from design, but from art requirements I cannot meet. So soon I will have Hoopfighter done and dusted. I now have the 29 videos ready to go into the app. Maybe even tonight. Posted by VoodooChief at 10:53 PM 0 comments Cut it time?